5 Lug Rear Disc Brake Kit with E-Brake Cables are and affordable and durable alternative to billet racing brakes. Takes Early 5 on 205 bolt pattern wheels. 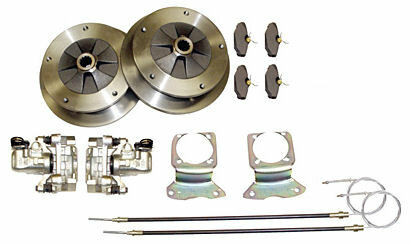 (Wide 5) Kit comes as shown with: Rotors, Calipers, Pads, Mount Brackets, E-Brake Cables and all Hardware & Gaskets. May not work with 14" wheels. Cables may need to be modified for Type 181 Things (Choose IRS for Things) Replacement Rotors (Solid and Cross Drilled) also available. Click Product info to choose yours.